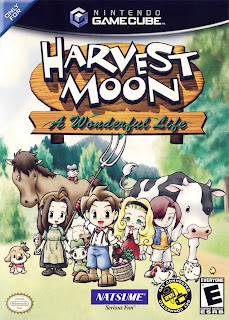 Harvest Moon: A Wonderful Life is a farming/life-simulation game, the tenth Harvest Moon game in the series, and is the first one on the Gamecube. 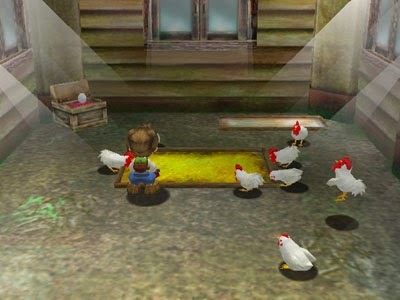 It's also one of the darkest entries in the series, and is a bit of a stark contrast from a normal Harvest Moon game. While the story itself is much darker, the character development is rather lacking. In this game, the main focus of the story is less finding a bride and more taking care of your child. This unfortunately means that while your child is well developed, your bride is essentially just a stock personality type, rather than a character that you'd actually fall for in real life. I find this to be a bit disappointing, but the idea of raising your child to be their own special character is an intriguing concept. If the development was a bit more balanced, with each important character getting their own notable qualities, then it could be a stellar game, but it just falls short of being enjoyable in this installment. The rest of the story is actually pretty decent, with characters aging and growing to be something of old friends, but they aren't enough to make up for the lackluster development of the main cast. I will give them credit for making the more bit characters lovable and quirky. Even if it doesn't save the story, it does make the tedious moments seem slightly more enjoyable and they can make town life somewhat more enjoyable. But the less noteworthy characters being enjoyable and the characters you'll talk to as much as possible being bland does not balance out to make the town memorable. The story itself does get dark at times, and it's mature approach is pretty interesting to witness. Though a game trying to hard to be dark and edgy can make a story feel forced, this game is pretty subtle with the darker nature, as it takes a realistic approach but relatively lighthearted approach. It's nice to see the dark side of life without being too overly depressing, and it makes for the older audience of Harvest Moon have something new to experience without being utterly heart breaking to the younger players. This game seems like it has the groundwork done to be incredible, but it doesn't live up to it's complete potential, even if it can be entertaining and quirky at times. 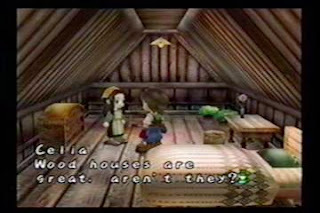 As it's a Harvest Moon game, the gameplay can get a bit tedious at times, but it's normally offset by the unique and entertaining characters. Sadly without the characters to make the gameplay more enjoyable, the gameplay alone doesn't make this game fun. However there is still that natural Harvest Moon charm that can make the dull parts more tolerable, even if it isn't as fun as it is in other titles. It's always nice to roam around town and talking to characters, working on your crops and taking care of your animals. As noted earlier, much of the story is based on your characters child, and as such a good deal of the gameplay focuses on the kid too. It's honestly a bit cute to watch them grow, and to help them develop into a mature and successful person. But having the main focus of the game no longer be on you is, and this sounds terrible, pretty boring. They're fun to help, but it's not your character. You don't personally grow to become a better farmer, and you don't have much to expand upon in terms of the farm or your marriage. If your favorite aspect of life stimulation games is raising children, then you'll find the gameplay to be much more enjoyable. But I personally like the farming and marriage aspects of Harvest Moon games, and those take a backseat to raising your child. It's very experimental, and it could be decent if it was more balanced out, but your main purpose in the game is to be a parent, not a farmer. As a side note, there are only three marriage candidates, further showing that marriage isn't a core aspect of the game. It seems mostly tacked on so you have a wife to give you a child, and there's little reason to care about which one you marry past shallow, physical reasons. The farming is still pretty run of the mill, and it doesn't really improve on past installments, but at least it's still simple and fun to do. The graphics aren't particularly bad, but they're nothing stellar. It's pretty average, but it's nothing noteworthy. It's just a standard looking game with a moderate amount to load. The character designs are decent enough, and each character has a distinguishing appearance, with none looking particularly generic. As for the design of the game, it's got a very quaint feeling, and it makes the game seem somewhat peaceful, in an odd way. It's nothing particularly award winning, but it makes the game somehow more pleasing. The sounds are much like the graphics, nothing worth talking about, but adding to the calm and quaint nature of the game. They all sound accurate, with cows sounding like cows and dogs sounding like dogs, so there's nothing to complain about. The soundtrack, if it can even be called, is not memorable in any way, but it also isn't grating on your ears. It's just so average, but peaceful. As with every Harvest Moon game, it's extremely addictive, but the replay value isn't as high, due to the more simplistic nature of this game. The game can be considered pretty easy, with it not taking much effort to make yourself married and wealthy, so you'll run out of things to do unless you find taking care of a child to be exciting. There's still that special charm that's hard to explain that makes the game hard to put down though, and it's fun in smaller doses. But you'll eventually run out of things to do, and the repetition of a farming game can become more noticeable. But still, it's not a game that's easy to put down, and you'll at least feel the need to play for some time. If you're a fan of Harvest Moon games, you'll likely be drawn to this game. It's by no means perfect, but it's no less addictive than a normal Harvest Moon game. You may be disappointed, or you may fall in love with it, but you should definitely try it out to find out your opinion on it. If you're new to the series, this one may not be the best to try out first, but it's worth a try. It doesn't properly capture what makes the series so addictive and enjoyable, but it's still got the noticeable charm. I'd recommend borrowing this game if you're new to the series, but you also may want to try a different game in the series first. Give it a shot if you can't borrow it, it isn't a bad game, it can just get a bit boring sometimes. For the most part, you won't feel ripped off if you buy it, but it may not live up to your expectations. Overall, Harvest Moon: A Wonderful Life is a decent game, but it's nothing particularly memorable. It's a decent time waster, but it isn't the best in the series. It is however a game that shouldn't be overlooked, as opinions can vary pretty drastically with this game. If you're a fan of past installments, give it a shot. If you're interested in the game by itself, take the risk. It's a fan favorite to some, and a pointless game to others. Try it out, cause you'll either be drawn to it's oddly enjoyable nature, or waste a little bit of time testing the waters with a series that may get you pretty addicted. 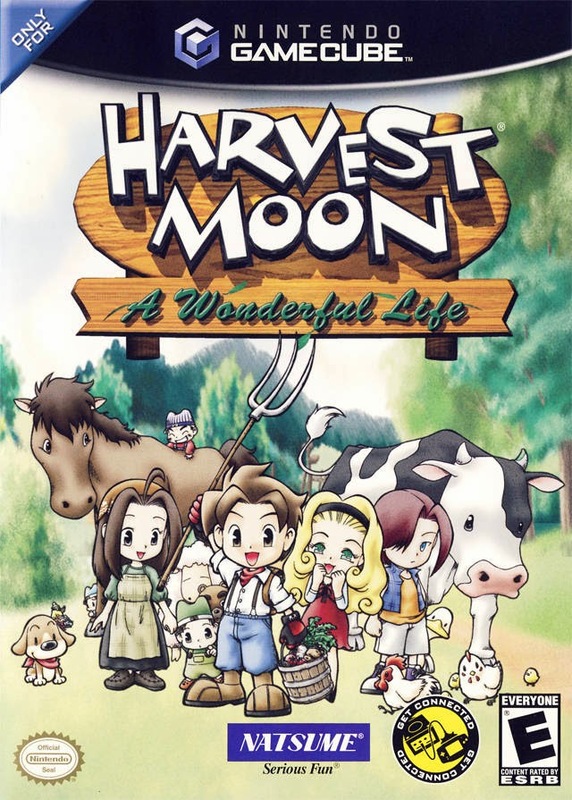 Don't let it be the only Harvest Moon game you try, but don't pass it up. It's got a nice charm that's very hard to explain.